Phoenix Burning, Rising or Renesting? When last presented a year ago, the sale value of the property was deemed to be $12m. Since then, that value has been increased, and at $15.7 is the mean of four independent offers ranging from $14-18m (less sale costs). The graphics supporting the different models discussed were very poor. Of the 3 graphs provided, only one was properly labelled on the vertical axis: it was extremely difficult to read the key operating profit graph. It needs to be reissued to members with careful explanation provided. Phoenix Burning (never to rise, possibly) or Nest-Refurbishing : This is the most controversial scenario, but is it beloved of some members who speak nostalgically of the club remaining in its current form and being refurbished – a new lift and air-conditioning are just (expensive) starters in the herculean task of making the space more glamorous and inviting, and profitable. Its supporters speak of this in the face of clear evidence of decay (is it deliberate, or the result of lack of funds – no-one seems clear, but there’s a case for a business plan, often raised and never implemented). Nobody seems to question that the Club’s fusty, broken down infrastructure is the root cause of operating losses. In this scenario, according to the subcommittee looking into redevelopment, whose discourse is that of ‘disaster’, the club would die a financial death, despite its rich asset – a corner CBD site close to two stations. Because of its operating losses over many years, banks have said NO to a loan for refurbishing. Members point to spaces in the building that are not used, or badly used, which might be rented out, thus generating badly needed income. Phoenix Rising: The idea of the Club being redeveloped as a high-rise tower on the site is still being mooted, despite the costs of even entering negotiations with developers. One of the disadvantages of this scenario is what happened last time the Club entered into negotiation with developers: ‘deal creep,’ whereby developers at the last minute reduced the space available to the Club by four-half floors, effectively halving the space originally promised. I’ve not yet heard a figure placed on the costs to the Club of this unsuccessful negotiation. The limitations of the site are quite daunting: a small footprint, inconveniently located structural pillars which under any redevelopment (or retention) scenario make for less than optimal sightlines, and the need to keep the façade for heritage reasons. Phoenix Renesting: The sub-committee’s report seems to favour moving to a new site, though so far no scouting of possible properties seems to have been done, and members doubt that so central a location, close to transport links, will easily be secured. It is assumed under this scenario that new premises might be secured for $11.3m and that fit-out might cost $1.7m, with elimination of the debt of $1.5m. It’s further assumed that the Club might get to rent the current premises until it is redeveloped. The AGM will be critical as the question of selling the land will arise once more. Even though it will go through under the Club’s old rules, it requires 66% of the membership to vote ‘yes’ before the land can be sold. This change means that the reasons have to be cogent, and the membership alert. It alarms me that the membership turning up to these crucial meetings is not very representative: women are few in number, as are young people. The newly arrived are not represented either, and there is a general sense that much more needs to be done to woo/persuade them to join. Has the Club arrived at the most critical point in its long history? Does it have a future at all as a social and cultural club? Are the grey heads (mine among them) a symptom of its future? And will it be on the Latrobe/Queen Street corner? Frances Devlin-Glass is a member of the Celtic Club, and serves on its Cultural Heritage Committee. 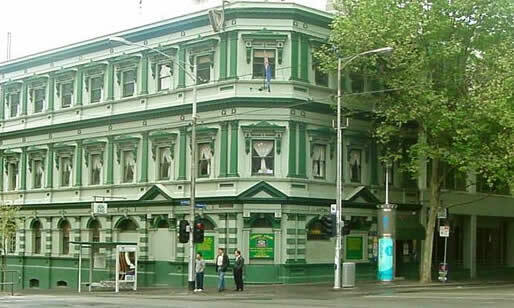 At the moment the Club is a pub and pokies joint. It hosts the occasional function, and provides space for Irish language enthusiasts in the uninviting basement. As mentioned above, most of the space upstairs is wasted. Little about the place lifts the heart; there is a feeling of social and physical decay. I suspect that the grey heads will vote to keep the land, which will at least force other decisions. Well Colin, I can’t argue with you, but I hope you’ll come along to the AGM and try to dispel some of the sense of decay that you have noted.